Four women, beneficiaries of the activities of the Local Partnership for Employment in Prnjavor, whose work is funded by the European Union (EU) with 200,000 EUR, started working at KLM Company on 1 February 2018. 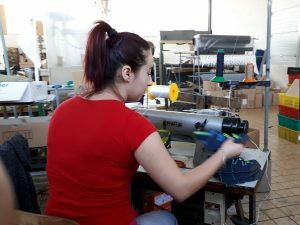 They are four out of 75 unemployed persons from Prnjavor which will be trained for work in metal, word-processing, food production and leather and footwear industry organised by the Partnership, and out of which 50 unemployed persons will be employed. 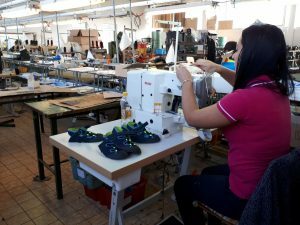 Due to good results and efforts demonstrated during the training, four women began to work as shoemakers in footwear company before the training was completed – two of them were unemployed over ten years and two were younger than 30 years. The partnership consists of Enterprise Development Agency Eda, (leader position), Municipality of Prnjavor, Employment Bureau, Secondary School Center “Ivo Andrić” and companies MI Trivas and Topling. Partnership activities are implemented within the project “Partnership for quality jobs and competitiveness”. The aim of the project is to establish a balance between supply and demand of labor force at the local labor market realising the main activities of the project: development and implementation of training programs for industrial occupations, employment and increase of productivity and competitiveness of local producers. 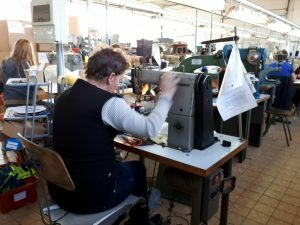 The project “Support to Local Employment Partnerships in B&H” is part of the EU Program for Local Development and Employment, which is funded by the European Union with amount of EUR 19 million in order to reduce unemployment and improve living standard in BiH. From 1 December 2017 until today, 14 people are employed within the project, and more than 600 will be employed until January 2019.